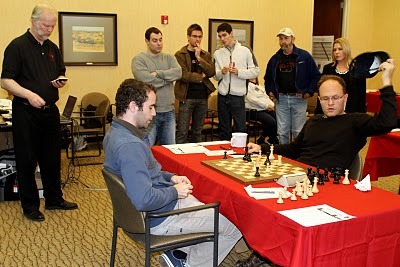 GM Julio Becerra won convincingly the 2010 edition of SPICE Spring Invitational. He finished with 6,9/9 a full point ahead of competition with 5 victories, 3 draws, and only one loss. The rest of the medals went to Gergely Antal and Benjamin Finegold who shared the second position with 5,5/9. FM Darwin Yang finished 5-6 with 4,0/9, which was enough for a IM norm. IM Gergely Antal and FM Eric Hansen had chances for norms until the last round, but they could not win their games against GM Becerra and GM Jesse Kraai. As part of the SPICE events tradition, there was a party at Susan Polgar’s home prior to the final round. As usual, there are plenty of food, chess, bughouse, chess trivia, and fun. After the end of the competition, Susan Polgar offered a chess quiz to the participants of the event. Here are the questions, how many of them can you get right? 1. When did William Steinitz become the first official world champion? 2. What is GM Pal Benko’s birth country? 3. What year did the Polgar sisters win their first Olympic Gold for Hungary? 4. Which country finished second at the 1966 Chess Olympiad? 5. Who won the men’s individual gold on board 1 at the 1970 Chess Olympiad? 6. What was Bobby Fischer’s highest rating? 7. In which country does the Indian Vishy Anand have his second home? 8. What was Topalov’s highest ever rating? 9. Who won the 1957 world championship match between Botvinnik and Smyslov? 10. What year did Kasparov lose his match against Deep Blue? 11. Who said “When you see a good move, look for a better one”? 12. Who said “I don’t believe in psychology. I believe in good moves”? 13. Who said “It is not enough to be a good player… you must also play well”? 14. Who said “There are two types of sacrifices: correct ones and mine”? 15. Who said “Life is a kind of chess, with struggle, competition, good and ill events.”? 16. Who said “Chess is a test of wills”? 17. Where was GM Walter Browne born? 18. Who was England’s first GM? 19. Why are the Melody Amber events called as such? 20. Which currently married chess couple has the highest combined average rating?